Antique Art Nouveau Lady Table Lamp. 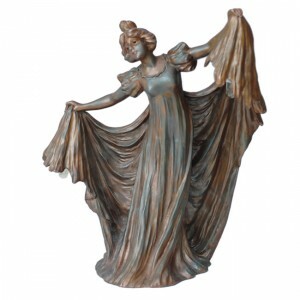 Lady in Elegant Pose with Draped Dress. Original Antique Casting in Spelter. Natural Wearing with Spelter Color Showing Through Original Light Bronze Acid Patina. Double Candelabra Sockets Hidden Under Drapery. Originally Cast Circa 1890s. In the Style of Gustav Gurschner. Non-Artist Signed Piece.